Founded in 2015, our vision is to guarantee zero confirmed bitcoin transactions enabling bitcoin service providers to accept bitcoin transactions instantly and offer this added value to their customers. 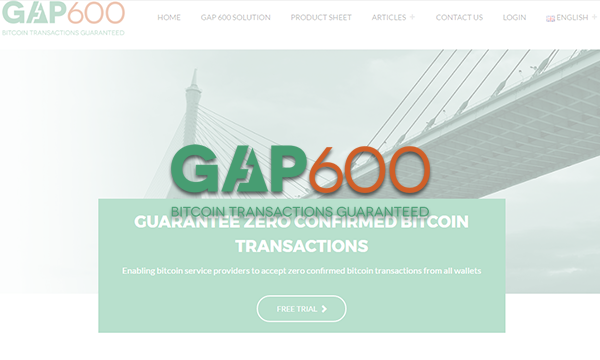 GAP600 has been in production since August 2016 processing in excess of 200k transactions – in the tens of millions USD transaction value per month. Our team has experience in the field of online financial infrastructure development, payment fraud detection, sales and marketing. The team includes professional data scientists and statisticians skilled in building real-time risk engines that model transactional fraud, as well as network, software and bitcoin engineers. We are here to focus on real time bitcoin transactions so that our clients can focus on their core business bitcoin services.